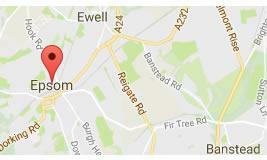 Thanks for visiting Epsom Oven Cleaning for professional cleaning of ovens in the Epsom area. Epsom Oven Cleaning are a family run oven cleaning company based near Epsom covering Epsom and surrounding areas. We are fully trained by the Dirtbusters Network and provide a courteous and professional oven cleaning service. Only eco friendly products are used in our cleaning process. We only use biodegradable products, specifically developed for the process, that are 100% safe with no fumes or odours, and your oven is ready to use as soon as we finish. Call 0203 633 1589 for prices and information or contact us online. As a family run business we pride ourselves on offering a reliable, affordable & fully insured oven cleaning service in Epsom and the surrounding areas of Tadworth, Ashtead, Leatherhead, Cobham, Epsom, Chessington, Esher, Worcester Park, Surbiton, Thames Ditton, New Malden, Kingston upon Thames, East Molesey, West Molesey, Walton on Thames, Waybridge.. If you need reliable oven cleaners for your Cooker, Aga, Range, BBQ or oven cleaning then call 0203 633 1589 for prices and information or alternatively you can get an oven cleaning quote online. Why Choose Us for Oven Cleaning in Epsom? You can be assured that our oven cleaning service will be of the highest quality, carried out by a reliable competent, honest oven cleaner and our oven cleaning service covers Epsom and the surrounding areas of Tadworth, Ashtead, Leatherhead, Cobham, Epsom, Chessington, Esher, Worcester Park, Surbiton, Thames Ditton, New Malden, Kingston upon Thames, East Molesey, West Molesey, Walton on Thames, Waybridge..
Get an oven cleaning quote online or call 0203 633 1589 for an instant oven cleaning quote. If you are looking for professional, fully insured and reliable oven cleaners in the Epsom area Contact Epsom Oven Cleaning today!